There's something you should probably know about Miami Connection (no "the"), and it's not that the movie takes place in Orlando: the story of how Miami Connection came to be, and subsequently, almost "not to be," is more interesting than almost anything that happens in the movie. Don't get me wrong - watching a bunch of non-actor, non-musician, martial arts students and their motivational speaker master try to tell Romeo and Juliet with motorcycle riding ninjas and rocking synthesizer tunes has entertainment value. It's just not as crazy as how Miami Connection even made its way to a re-release, courtesy of Drafthouse Films. I don't want to rehash it, because every single review I read had a recap, so I'm just going to put a link to this CNN article that covers the basics pretty well. 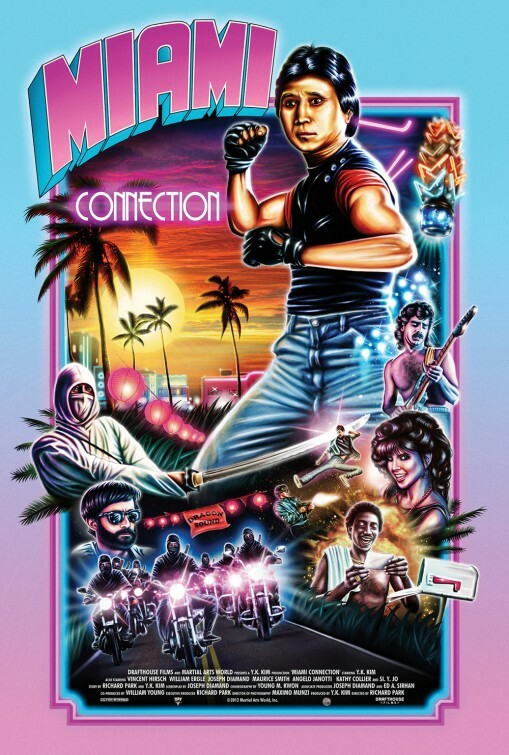 Just know that Miami Connection only had a slightly longer theatrical lifespan than Death Bed: The Bed That Eats and that we were a hurricane away from never being able to watch this movie. Whether you determine that to be a good or bad thing is entirely up to you. For me, I'd like to side-step most of the amateur acting, the fact that Dragon Sound seem to be barely aware of how to play their instruments, or the earnest message promoting non-violence that follows the heroes of the film brutally murdering the ninja gang who ambushes them. If you want a laundry list of the reasons why Miami Connection qualifies as a "disasterpiece," reviews are plentiful. You will laugh quite a bit, you'll scratch your head. You might even hurl. But instead of covering well tread ground, I thought I'd point out for all the things that Kim and co-director Woo-Sang Park (Chinatown 2) - under the pseudonym "Richard W. Park" - do badly, they do manage to set up plot elements and pay them off later. Not consistently, and perhaps not always very well, but there IS an attempt to introduce a seemingly pointless plot element and then come back to it later. For example, let's take the scene where Kim and two students are sparring on the campus of the University of Central Florida for what feels like fifteen minutes. In addition to demonstrating that Kim is very good at making his students look foolish, the scene also establishes knife defense and foreshadows how the climactic battle will end, all while seeming to be playful, pointless padding. Much has been made of the "I found my father" subplot of Miami Connection, mostly in the quasi-ironic "for your consideration" video on Youtube, but most of the movie is a series of "Dragon Sound does something, is followed by the rival band, and fights" until it's time to do that all over again. This goofy attempt to add pathos to one of the members at least goes somewhere, and more importantly, leads directly to the final showdown between the ninjas from Miami and our heroes, who spent most of the film never even in the same room together. Dare I say it even tricks us into believing there might be tragedy befalling our happy-go-lucky band of misfits? Okay, so I'm giving Miami Connection more credit than most people are willing to, but it only seems fair to approach this review in a manner other than "ha ha, it's SO BAD and you're going to laugh at how bad it is" because that's the general consensus. Miami Connection is, at times, like the line in Ghost World when Enid says "this is so bad it's gone past good and back to bad again." There's an undeniable earnestness behind all of the lack of acting chops, and everybody's giving it their very best. It's just not always enough. Labels: 80s Cheese, Disasterpieces, extreme violence, Martial Arts Gone Wild, Ninja, Rock and or Roll, Summer Fest, Summer Fest 5, What the Hell was that?